Two Century-old Inn Featuring Traditional Cuisine in Historical Tsumago-juku. 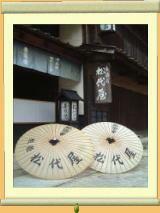 Founded in 1804, Matsushiro-ya is a classic example of a typical “Hatago” style traveler’s lodge. Guestrooms are divided only paper ‘fusuma’ paper screens, and there are no TVs or clocks in the rooms. Guests can experience an escape from modern civilization one day in their lives. Guestrooms are divided by 'fusuma' paper screens, and baths and toilets are shared, as in the olden days. Please understand that personal privacy is rather limited as a result. From Nagiso Station(JR Chuo Line), 8 min by Ontake Bus bound for Magome or Hogami; use the "Tsumago-bashi" bus stop. Or, 10 min by taxi. From Nakatsugawa IC, via Route 19 towards Kiso Fukushima, then Route 256 in 25 min.